Incidents throughout the region kept the team busy this weekend. 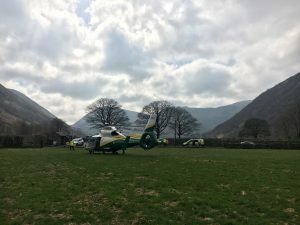 Our teams in both Cumbrian and North-East bases had a relatively busy time as much of the region had some dry weather over the weekend. On Saturday we were activated at 4.10pm to the A66, Darlington. Our paramedic and doctor team assessed and treated a patient and they were flown to hospital. On Sunday, we were activated at 1.01pm to Hartsop, Penrith. 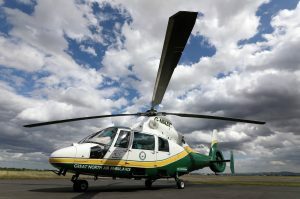 Our critical care team assessed and treated a patient before flying them to hospital. Later we were activated at 5.24pm to Black Sail Pass, Ennerdale. 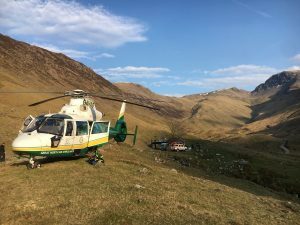 We worked alongside the Cockermouth Mountain Rescue Team to assess and treat a patient before airlifting them to hospital. Please continue your support by donating, volunteering, playing our lottery – whichever way you choose!